Ibrahim Kamel, the chairman of KATO Investment, the Egyptian holding company, and Oleg Demchenko, the president of Russia's Irkut Corporation, have signed the necessary papers on the development of their cooperation in the MS-21 project at the Dubai Airshow 2015. "Within the scope of the cooperation program, the agreement was signed on the delivery of six MS-21 aircraft for Cairo Aviation (the airline is a subsidiary of KATO Investment). The agreement also stipulates for an option to buy 4 MS-21 airliners," the press release distributed at the air show on Nov. 9 said. The counterparties are considering, upon Kamel\'s initiative, the creation of a regional hub for repairs and maintenance of MS-21 jets near Al Alamain, the international airport situated 184 kilometers away from Cairo. "KATO Investment intends to allocate, free of charge, the land plot adjacent to the airport for the industrial premises to be built there. 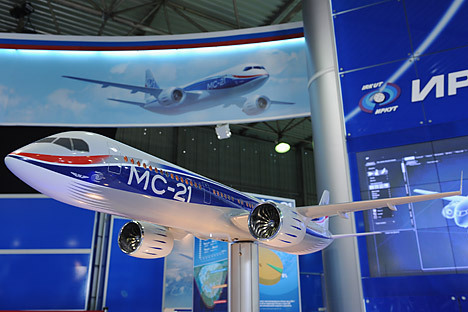 The projected hub will create additional preconditions for the MS-21 to be promoted in the countries of the region," the Irkut press service said. KATO Investment is a major private investment holding company that has its diversified business in Egypt and elsewhere. The holding company is specialized in investing into consumer goods manufacturing, agriculture, tourism, air transportation and airport services. KATO Investment includes more than 20 large firms. Cairo Aviation airline operates Russian Tu-204 jets. Irkut Corporation, a member of the United Aircraft Corporation, acts as the main contractor in the 'MS-21' project of short/medium haul aircraft. The jet was designed by A.S. Yakovlev Design Bureau, the main design branch of the Irkut Corporation. The first MS-21 airliners are being manufactured at the production facility in Irkutsk, Russia, for the purpose of flight and structural tests.